For Holidays, we receive many greetings, thanks, and attention from our homeowners and investors. 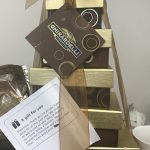 For example, this chocolate tower says: “Thank you for all you have done for us this past year! We really do appreciate all your help in making our rental home a success. Have a wonderful Christmas and Happy New Year.” It is a big honor when our property management work is being recognized by our valuable investors. But what enables us to successfully manage properties and satisfy investors expectations? The answer is our tenants! Every property manager takes care of his/her renters in the unique way. We believe that Holiday season is the best time to give thanks. Therefore, every year, we dedicate month of December to show appreciation to our wonderful residents. It starts with planning of the gifts. 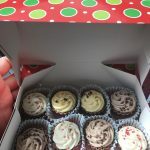 This year, we ordered delicious and specially selected Cupcake Chocolates. They were mouth-watering almond praline, cappuccino ganache and salted caramel. Then we created a hand made gift boxes. To make it more unique and personal, we ordered personalized labels saying: “Mila Realty wishes your family Happy Holidays“. Moreover, the label had our family picture of Mila Realty management. While all of our tenants have met at least one of our office representative during the move-in inspection, many of them have never seen Mila Realty management family at once. It also showed that we are all live people, and not just a tenant portal, which runs tenant screening, collects rent, or resolves maintenance tickets. The greatest part was the delivery of goodies and meeting the tenants. 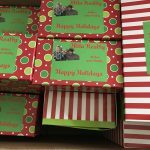 It took our Orlando property management team about 10 days to deliver our Holiday treats. We manage properties within Orange, Osceola, Lake, Polk, Seminole, and Volusia counties, so meeting some tenants was more difficult than expected because of the traffic on the roads and busy schedule. But all the tenants were happy to see us and even take holiday pictures with us. 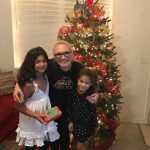 Like this photo with two sweetest girls, whose parents rent in our Venetian Bay community in Kissimmee.